One area of evidence and trial presentation that has become extremely popular right now for divorce attorneys is whether or not social media posts, updates, and messages are admissible in divorce court and what responsibilities lawyers and their clients have regarding preserving social media evidence without risking getting in trouble for tampering with evidence. These days social media usage has become a very regular part of the daily lives of millions of Americans. We go on Facebook to tell the world that we had a bad day, we go to Twitter to update the world on what we’re doing, we go on Instagram to show the world where we’ve been and how cute we think we look in this new outfit or with this new hairstyle. Regardless of which social media site we frequent if we are parents who have the possibility of becoming involved in child custody litigation then we may be unknowingly creating massive amounts of evidence that could be used against us in court. Likewise we could be passing up the opportunity to gather massive amounts of evidence against the other side to be used against them in court. Regardless of where we fall in those categories the common fact is that most lawyers and clients do not realize just how strict the rules are regarding entry of social media evidence and preservation of social media evidence during a court case. After extended litigation the lawyer was fined $500,000 and suspended from the practice of law and his client was fined $180,000 for listening to his lawyers advice and essentially destroying evidence. This should be a very scary to divorce lawyers and litigants alike. It is very common in family law and divorce cases for parents to post angry rants or inappropriate photos on Facebook or Twitter and then later remove them. The truth is they could be setting themselves up for an allegation that they have willfully concealed or destroyed relevant evidence. What rights do people have to make alterations to their social media accounts? Apparently the consensus is that social media users are free to change their privacy settings, to take down photos and posts from their accounts as they see fit as long as when they do that they keep copies of the posts or the photos that they are removing. How can I keep copies of all of this stuff? There are many ways that a social media user can retain copies of the posts and photos that they are wanting to remove from the internet. For example Facebook users have the option to click a link in their settings and download a single file that contains their entire Facebook profile and history to save for a later time. Though I am unaware of similar features on other popular social media sites I do know that most cell phones, tablets, and PCs permit the user to take screenshots of their social media pages to be saved either on a hard drive, jump drive, or emailed to themselves. 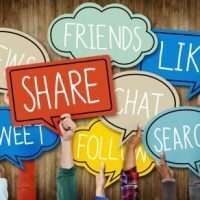 Can Social Media Posts Be Entered Into Evidence At A Divorce Hearing? It is very common for judges to permit printouts of photos and posts from social media accounts to be entered as exhibits of evidence in hearings and divorce trials. If the lawyer is able to lay sufficient foundation that the item offered into evidence is what it is purported to be then judges will normally allow it to be entered into evidence. This means that through questioning the lawyer establishes, to the court’s satisfaction, that this printout of John’s Facebook wall is actually a printout of John’s Facebook wall. If the other side then continues to say that they did not post the item that is shown it would be considered by the court to affect the weight given to the evidence rather than whether or not is it is admissible. One problem that we currently face as trial attorneys when it comes to entering social media evidence in court is that this is a relatively new topic and there is not a lot of case law for us to rely on when attempting to enter these type of items into evidence. This means that different judges could have different requirements that the lawyer must me before the judge will permit the social media information to be entered into evidence. At the end of the day social media users could benefit by exercising a little bit of common sense when posting photos and comments on the Internet. This is because once you put something on your social media page it become discoverable evidence for a court case even if you later go back and remove those items from your account.